Obviously, if you read this blog you know that toys are my favorite things. Seeing the hottest toys on the market AND being able to play WITH my kids is total toy nirvana though! And I get to do that at the new Play Fair 2016 in New York City. 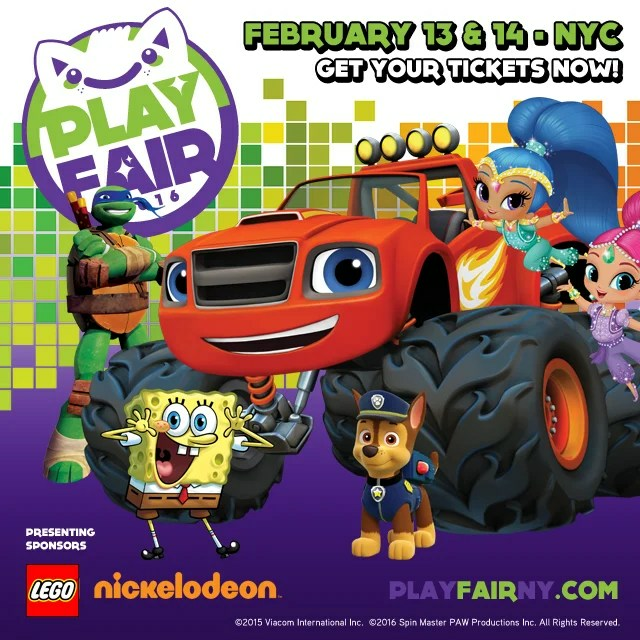 Play Fair 2016 is in NYC at the Javits Center on February 13 and 14, 2016. This is an inaugural event, hosted by the Toy Industry Association (TIA) and LeftField Media, for families and toy collectors to enjoy a weekend in New York and experience an interactive, fun-packed event with presenting sponsors LEGO Systems, Inc. and Nickelodeon, as well as other toy and family brands, including Mattel, Hasbro, Warner Bros. Pictures, Crayola and Toys”R”Us. There will be toy reveals, live performances and photo ops. Specifically, attendees can see the new Batmobile from Warner Bros. Pictures’ upcoming film “Batman v Superman: Dawn of Justice” (my six year old cannot wait to see that! ), meet television characters like Nickelodeon’s SpongeBob SquarePants, PJ Masks, Paw Patrol and the Teenage Mutant Ninja Turtles, and be interactive with toys, like building Lego race cars. In addition, retail areas will allow attendees to purchase show exclusives, limited edition products, and rare variants of beloved toys and games. Other experiences will include interactive opportunities with the people behind top YouTube toy channels, such as The Mommy and Gracie Show. You don’t have to be a blogger to attend. You only have to love playing and love toys! So it is a fun adventure for any family! Tickets start at $30 per session at this ticket page, but there are also family packages where you can attend one or more sessions throughout the weekend. Morning sessions run from 9:30 a.m. to 1:30 p.m. ET, and afternoon sessions are open from 3:00 p.m. to 7:00 p.m. ET. Or pick up a VIP Weekend Experience Pass for $145, which includes priority admission to all four sessions and a collectible exclusive Play Fair vinyl figure. Tickets are expected to sell out quickly, so if you are interested, get your tickets soon! Use code “ToyInsider” for $5 off a ticket! Then consider making a weekend of it. Each Play Fair badge will also unlock rewards and discounts at participating retailers, museums, restaurants and cultural institutions in New York City, turning Manhattan into a fun treasure map waiting to be discovered. Attendees can also take home the play experience with a Play Fair Goodie Bag too. There are even exclusive hotel discounts with rates as low as $139 per night. You can find a list of participating hotels online.